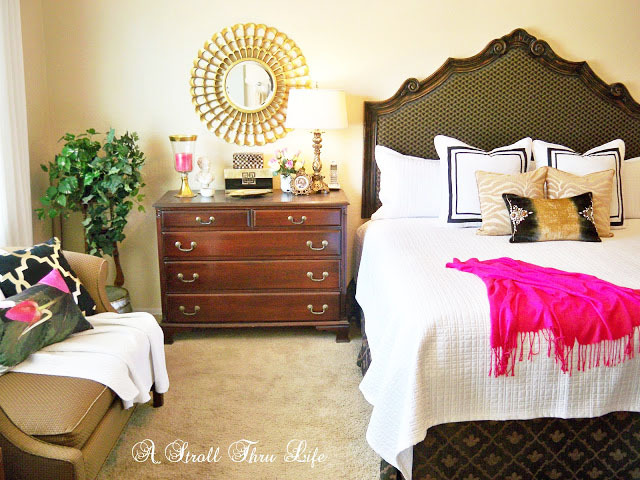 The last of the fiinshing touches have been put on the master bedroom makeover. I have to say, I really do like it and it looks so fresh and inviting. Black/White/Beige is one of my favorite color combos and allows me to add any accent color I like. For summer, I used Raspberry Pink and I really like the sharp contrast it has to the neutral background. A little unexpected and just plain fun. As I showed you earlier I dressed up some Ikea Lenda drapes with some black and white stripes. If you missed it, you can see that tutorial here. My old comforter set had matching euro shams and I really like that look, so I wanted to make some to coordinate with my new drapes. 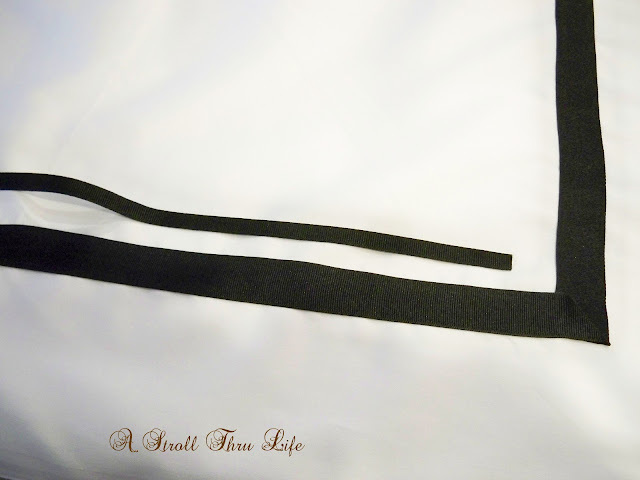 Since I added the two black ribbon stripes to the drapes, I thought the shams needed a similar treatment. I thought you might like to see a step by step on how I made them. Next you need to decide on the size of your trim if you are going to use any. 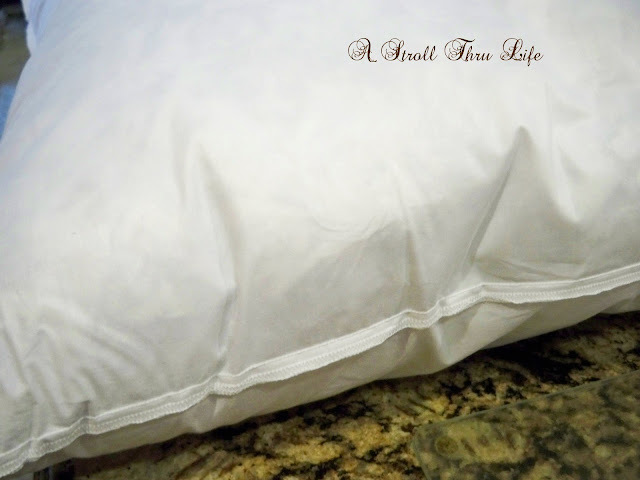 Since I added two bands of trim to the side of my drapes, I wanted to do the same on the shams. I went down a size smaller on each ribbon. I think this keeps the strips visually similar but doesn't overpower the pillow size. Next decide how far from the edge you want your first stripe to be. I chose about 4 inches since I knew we would have cording and a seam, so finished it would be about 3 1/4 inches. 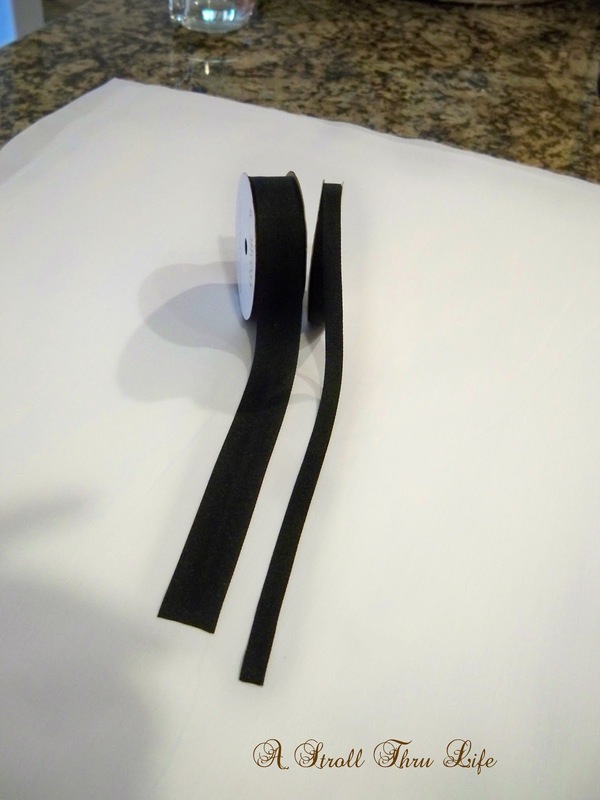 You will need to sew your ribbon down on both sides close to the edge. I am using grosgrain ribbon like I did on the drapes. 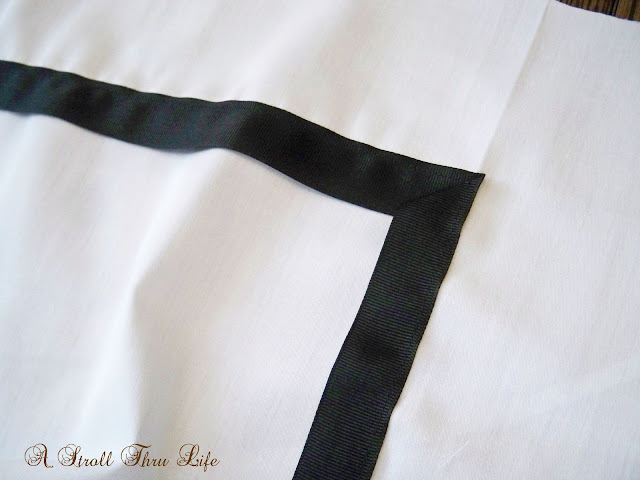 When you come to a corner, simply fold your ribbon over in a miter and continue around the corner to the next side. 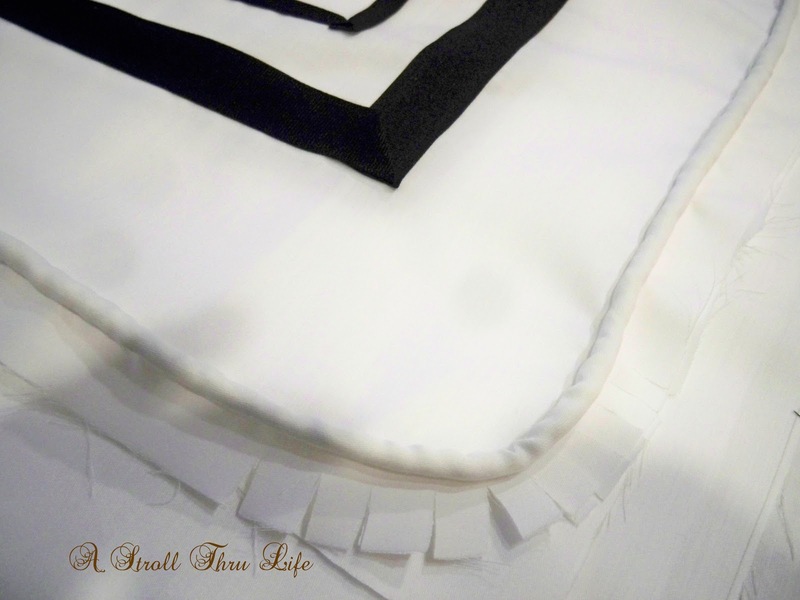 When you get to the place where you started, you do not have to miter a fold, just cut off your ribbon and fold the edge under so it makes a perfect corner. All done with the first ribbon. Now you can decide how far in you want to space the second ribbon. I spaced mine about 3/4 of an inches, but it is totally up to you and what you are using. 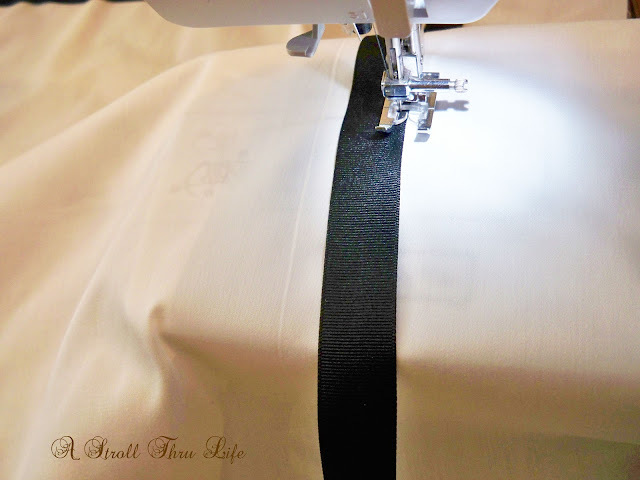 Sew all around in the same manner as the first ribbon. I think cording gives a pillow a custom look, so naturally I wanted cording for these too. 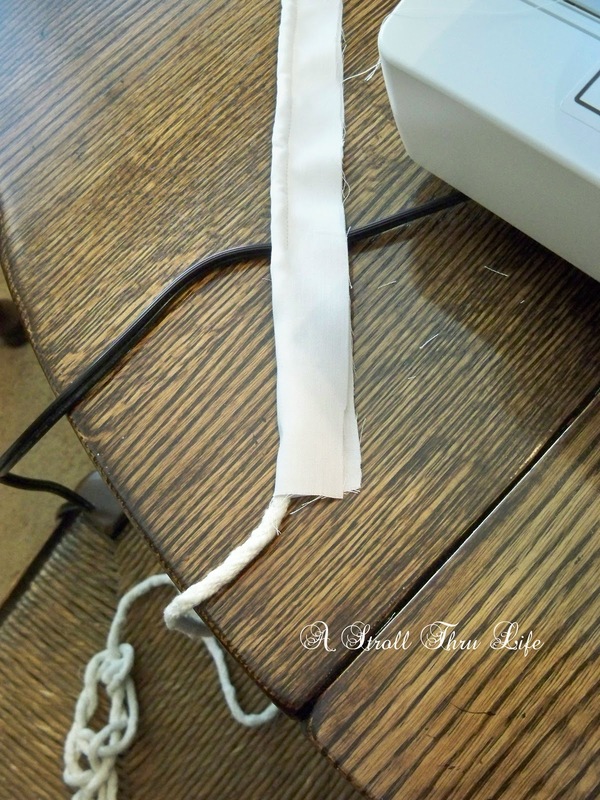 First you have to make your cording by inserting cord into a strip of fabric and sew with the zipper foot close to the cord. 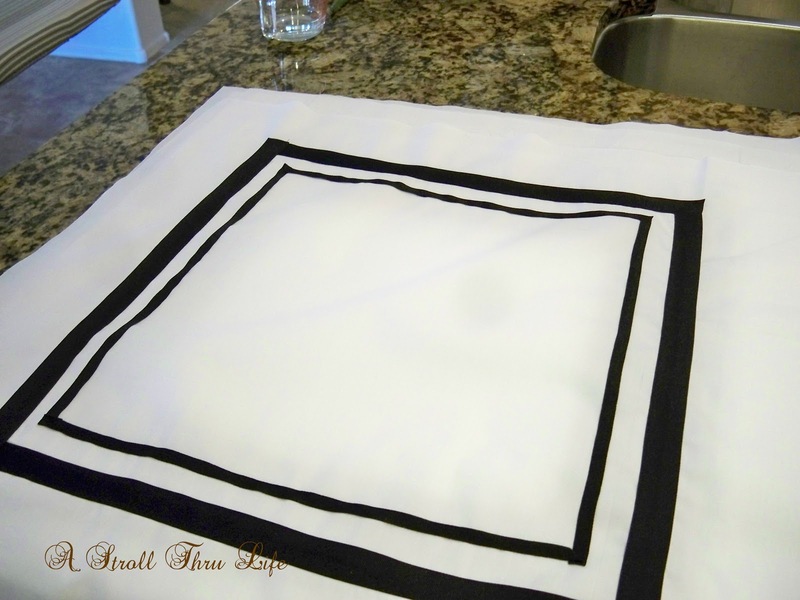 Next sew the cording on the face of your pillow cover. Cut the edge of the cording selvage as you round the corner for a smooth turn. I use a zipper, so my final steps were to add the zipper and sew the front and back fabrics together and insert my pillow form. 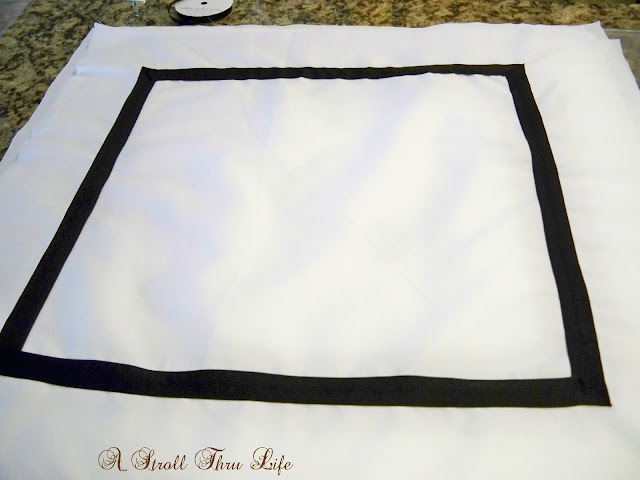 There are tons of tutorials on how to add a zipper, you can see mine here. 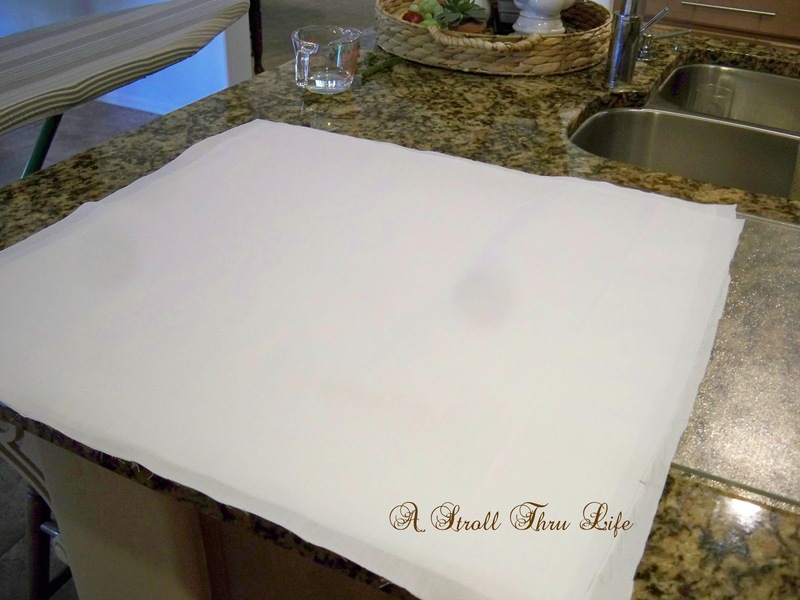 I bought 3 yards of polished cotton to match my coverlet with a 30% off coupon - total cost $12. Three spools of ribbon from Walmart - total cost $6. Grand total - $18. These small custom touches create a look of luxury for just pennies. Isn't that a genius concept. 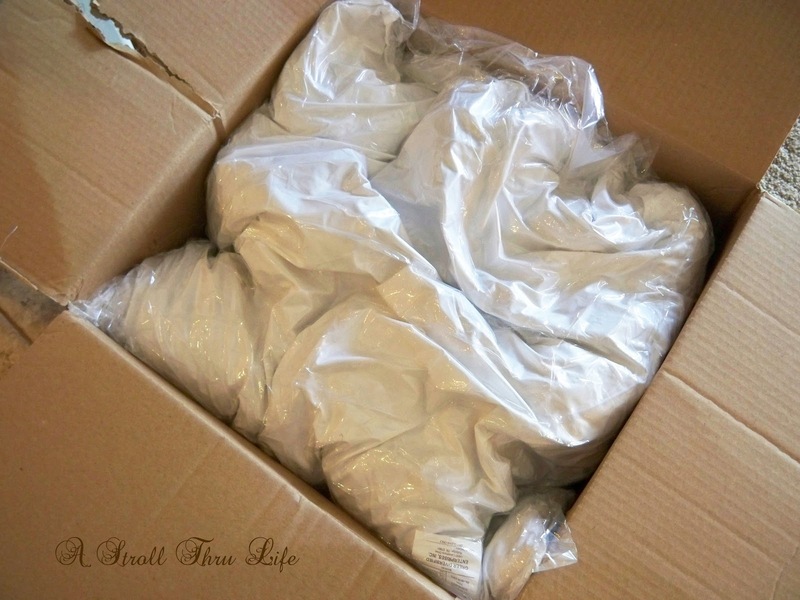 When I opened my cube, I found two fabulous feather down euro pillows enclosed in plastic. A really nice beautiful quality cotton with double stitched seams. No wandering feathers sticking out anywhere. The quality is very evident. A small karate chop and these add the perfect finishing touch to my bed. Now they are offering all of my readers a 10% discount on your orders - just use the code - -aStrollThruLife10. I am honestly really impressed with the quality of their pillows. Check out their site, I think you will be impressed too. I received product for this makeover, but all opinions are mine. 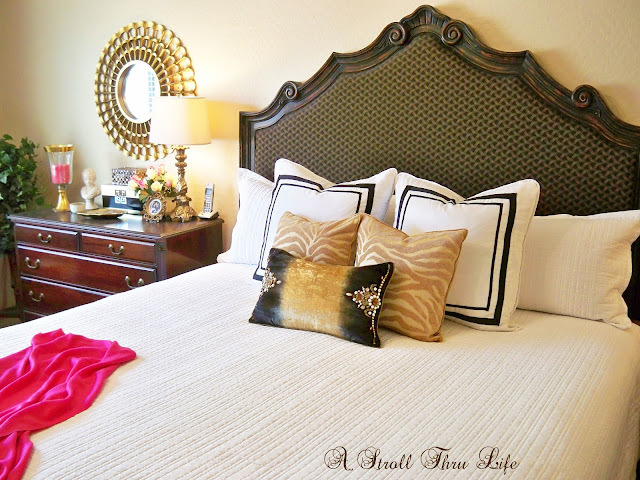 Your master bedroom looks so inviting and luxurious! I love those shams you made! Wow!!! Marty I love the new look! Fresh and inviting! Lovely, lovely pillows and you are an artist making them! The pillows look great, I have couple of goose down for sleeping, though, as they came with the comforter, but maybe if I dress them up they would look nice too. Happy 4th. of July weekend pretty lady. Such a perfect Sanctuary Marty! 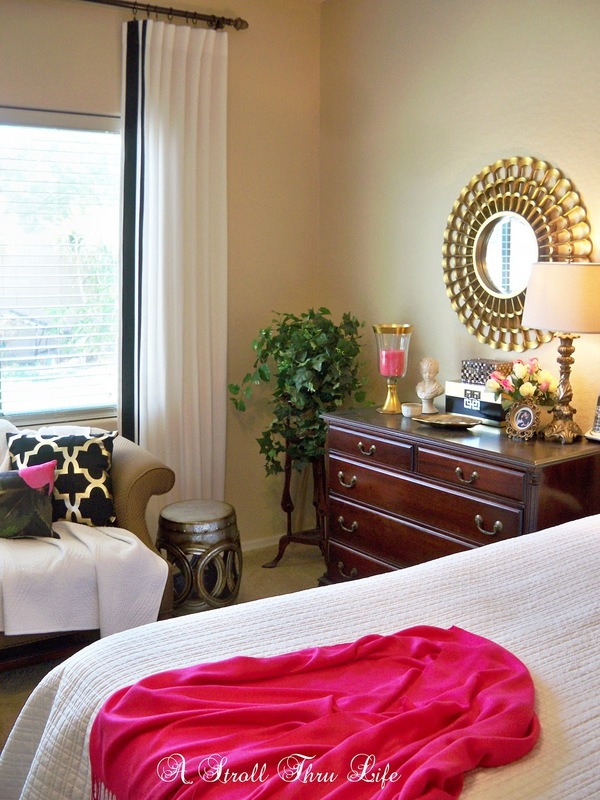 Love the changes and the small touches of pink in your room! Makes me want to re-do mine (which I should, after the baby totally changed my room entirely!)! I will check out pillow cubes, the shams you did are beautiful too! Really gorgeous Marty! Love the pop of pink. Those shams look PERFECT! I never would have known that you DIYed them! Your bedroom makeover is lovely Marty and I love the pops of pink. You did a great job adding the ribbon to the shames and drapery panels - thanks for the helpful tutorial! The shams are very pretty Marty. Your bedroom looks so gorgeous. 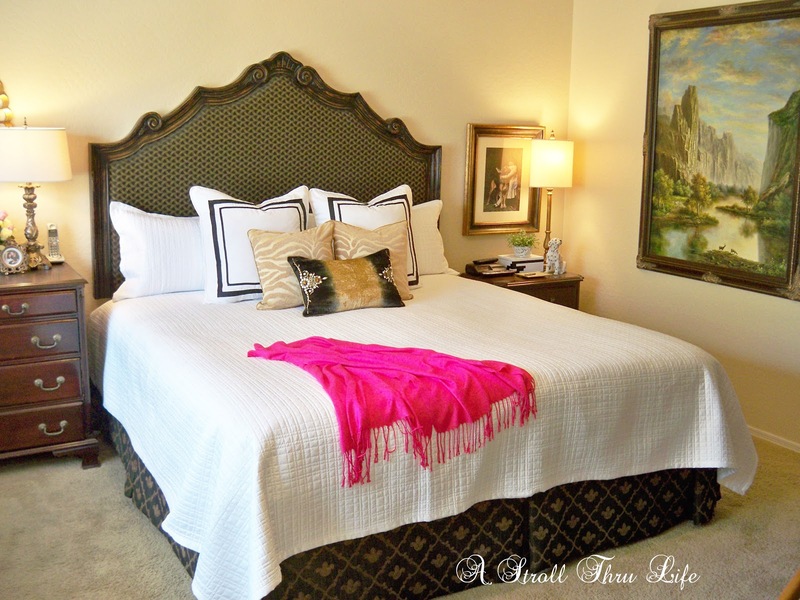 Your master bedroom makeover is so, so beautiful Marty!....You are so very talented in so many ways!...Love the euros!! Bedroom looks great Marty. So glad you finally found your spread for the bed and the euros look terrific. it's just beautiful, love that wonderful pop of pink!! Those pillows are FAB! I wish I could sew. Truth be told I have a brand new sewing machine sitting in my closet...I've had it 3 years. I need to just take the plunge and try to learn. I LOVE your master bedroom, and those pillows really tie everything together beautifully. Looks like a boutique hotel. Great work! Beautiful room! Love the pop of hot pink! Thanks for sharing at Thursday Favorite Things! Love the pillow shams Marty!! Marty you are so talented! These look great! Thanks for sharing at Home Sweet Home!